In case it hasn’t been made abundantly clear by my numerous podcast appearances, public lectures, and short list of published articles, I’m a Freemason. This generates a lot of curiosity in those who aren’t Masons. Occultists and esotericists, the main audience for this website, have lots of misconceptions about Freemasonry, so I get asked frequently for reading suggestions. The problem is, there is a ton of bad Masonic reading material out there. 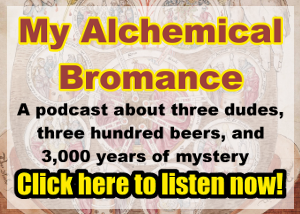 Back in March, I had a conversation with Jeremy Crow in episode 28 of My Alchemical Bromance. We discussed the Left Hand Path (LHP), about which I had only a surface understanding before we really dug into it. While there are multiple ways to differentiate between the two paths, we focused on one in particular that divides magical and mystical practices into two rough categories: those that seek to dissolve the self into a greater oneness are on the Right Hand Path, while those who seek to glorify the self and enable it to continue after death are on the Left Hand Path. When a person gets involved in ritual magic, they probably aren’t prepared for the amount of artwork they need to create. Wands, altars, and magical tools and weapons all need to be created, typically by hand. This can mean picking up skills like woodworking, sewing, painting, and drawing. As magical work becomes more complex, even metalworking and jewelry-making skills can be necessary. Hi everybody! As I am sure you have noticed by now, I am financing this website and my continued work using Patreon. This unfortunately means that a lot less of my new content is appearing here, but I have one piece in particular that I think many readers will be interested in: an audio lecture series on using the Art of Memory to memorize and work with Tarot cards. Currently I just have part one up, which covers the Minor Arcana pips. If you’re a Patreon patron, you can listen to it here. If you’re not yet one of my Patreon supporters, this series will be available at the $1/month level. That’s so cheap! Go get it. Support my work on Patreon for as little as $1 per month! Lately I’ve been trying out some dream magic from the Greek Magical Papyri (PGM). The PGM is a collection of Greco-Egyptian texts from northern Egypt in late antiquity, dating from 2nd century BCE to the 5th century CE. They describe a staggering array of ancient religious and magical practices, and were originally written in Greek, Demotic, and Coptic. There are quite a few dream oracle spells in the PGM, so I took some time to sort through them to figure out what they have in common and which would be the easiest to perform.